In their native environment, the search for food is a central activity in the day-to-day life of a parrot. The pursuit of this essential element through foraging not only nourishes the bird but also provides mental and physical exercise. Captive birds do not have to forage for food in the same way as their wild counterparts. Their keepers are responsible for feeding them. This fact greatly reduces the amount of exercise that a parrot would engage in on an everyday basis as it simply tries to survive. While this makes it easier for the bird to eat and eliminates the dangers of predators, it can lead to negative health effects related to the lack of exercise. As the human caretaker for a captive parrot, it is up to you to ensure that your bird is eating well and getting enough exercise. This guide is meant to assist you in making food choices that help in maintaining a healthy and happy parrot. Just about all species of captive parrots do well on a diet that provides a high quality, enriched pellet as its staple ingredient. These are available from many commercial pet food manufacturers in various sizes, shapes, colors, and flavors to appeal to your particular bird. You may need to experiment a bit to find the right one, but persevere and you will be successful. Pellets should account for between 40% and 50% of your parrot’s daily food intake. Fresh fruits and vegetables should be the next major component of your parrot’s diet. These will provide vitamins and minerals that are essential to your bird’s health. 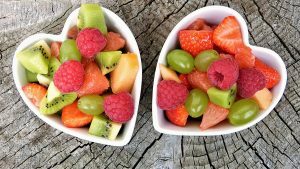 Your species and the particular bird may have some different tastes, but favorite fruits include grapes, blueberries, strawberries, and apples. Broccoli, corn, and peppers are among the vegetables that most parrots will readily accept. Below is a video showing an African Grey munching away on some broccoli. 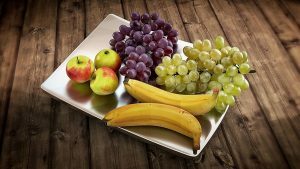 By using this chart from parrotsdailynews.com you can find the vitamin and mineral levels associated with various fruits and vegetables that you can feed your parrot. Calcium and Vitamin A are very important for the continued well-being of captive parrots. Deficiencies in either can lead to serious health problems. These can be avoided by providing the proper amount of fresh food for your bird. Some pet owners like to share some of their food with their parrots. This is usually ok in moderation, but be sure to avoid toxic foods, which we will investigate below. Never give your bird very hot food as they can easily burn their tongue. Seeds should only comprise a small part of your bird’s diet. Though many parrot starter kits come with a bag of seed which may influence a novice owner’s future purchases, a seed-based diet is not good for your parrot. They will, however, love it. Like letting children have unsupervised access to candy, your parrot will eat the fatty, unhealthy seeds to the exclusion of almost all else if given the opportunity. They should be used sparingly as treats and not left in your bird’s cage to be eaten at will. The ideal situation is where you obtain a bird that was hand-raised as a baby and has been introduced to a pellet-based diet. In this case, you can just continue with the preferred pellets, or experiment with alternatives, and supplement their diet with fresh foods. What could be easier? If you are adopting a fully grown bird that has been given up by its owner, or any bird that has been raised on an improper diet, you may face the serious challenge of changing its eating habits. This is not something that can be done overnight, according to the Edgeworth Animal Medical Center. To suddenly replace your parrot’s current food with unfamiliar pellets could lead to your bird starving as it does not know that the pellets are edible. Parrots are creatures of habit, and the loss of the familiar food items might not be mitigated by the appearance of a new food source. The introduction must be made in a more subtle manner. By using the pellets as treats you can get your bird to understand that they are to be eaten. Then you start adding some pellets and gradually reducing the number of seeds. Eventually, you will be able to eliminate the seeds altogether and reserve them for use as treats. Your bird will be much healthier thanks to your diligence. Below is a video that shows some parrots that have recently been converted to a pellet diet. Some parrots are reluctant to accept the fresh fruit or vegetables that we offer them. In these cases, resorting to bird bread or other baked goods may help in getting your bird the nutrition they need. The recipes for these baked goods often focus on corn-based flour and then add chopped or pureed vegetables and fruits. There are definitely foods and liquids that your parrot should never have the chance to ingest. Some of the more common foods that are in your home that should never be near your birds are listed below. A full list of what parrots can eat is available here. Chocolate – can lead to digestive and nervous system problems resulting in seizures and death. Avocado – the skin and pit of this fruit cause cardiac problems in parrots and any food with even trace amounts of it needs to be avoided. Apple seeds – contain trace amounts cyanide and are dangerous for your parrot. Apples are fine, but be sure to cut them so no seeds are available. Alcohol – beverages that contain alcohol are deadly to parrots. Caffeine – another highly toxic substance that is in coffee, tea, and many sodas. Keep these away from your parrots. Uncooked beans – these contain a poison called hemaglutin which is toxic to parrots. Cooked beans are fine as the cooking process removes the toxin. We hope that you now have a good idea about how to feed your pet parrot. Responsible parrot owners understand the importance of good nutrition and provide for the dietary needs of these magnificent creatures that we choose as companions. 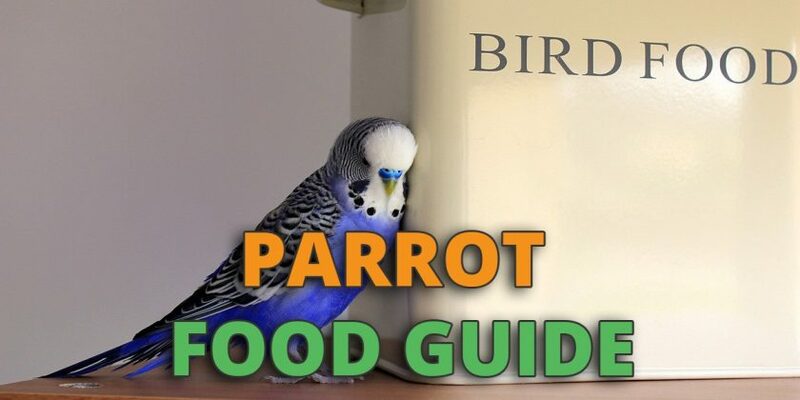 If you want a list of additional food your parrot can eat, check out our guide: What can parrots eat?